The United Parish of Lunenburg came together in May to dig perennials and raise money for Heifer International. The project demonstrated innovative ways to use member talents and interests, build the faith community, and affect global poverty and hunger - all in the spirit of God and our Christian faith. It all started with Linde Sacksen. Linde, a member of the United Parish, had turned 80 just days before the first dig. A gardener since the age of five, she had spent many years nurturing her gardens at her Lunenburg home. Linde had decided that the time had come to reduce the size of her gardens and their need for maintenance. Linde is a talented gardener and understands the value of plants. However, she also values the United Parish of Lunenburg and its long-time support of Heifer International. In the spirit of "rethinking church," she offered her well-tended perennials to church members in exchange for their donation to Heifer International. The United Parish raises money annually to support the mission of Heifer International. Heifer International is a global nonprofit organization that strives to end hunger and poverty and to care for the Earth. Heifer helps impoverished families to become self-reliant by providing them with food and income-producing animals and training. The United Parish didn't stop there with the project. Religious Education Director Ruth Ann White saw the opportunity to tap the leadership of three third-grade students who attended camp at Heifer's Overlook Farm in Rutland, Massachusetts during the previous summer as part of their religious education. The girls enthusiastically agreed to do whatever was necessary to help. The girls - Claire, Angelina and Breda - and their families met together with Mrs. White to help plan the event and share ideas. They identified volunteer needs, set a schedule for plant recipients, planned amenities for participants, and developed promotional materials, including posters. In conjunction with the dig, they planned and led a presentation on Heifer International for fellow Religious Education participants. Over three days in May, church members came together in Linde Sacksen's gardens. Present were Mrs. Sacksen, the three third-grade girls and their families, Ruth Ann White, volunteer diggers, plant recipients, babysitters (for young children of families who were involved), and Rev. Andy Burr. God's spirit could not have been more present in Mrs. Sacksen's gardens on the days of the dig. It reminded one participant of "Little House on the Prairie." Children were playfully running around the large yard, climbing backyard trees, and admiring the many colors and shapes throughout the gardens. Grown-ups dug in the dirt and gleaned gardening insights from Mrs. Sacksen. Volunteer digger Tom Mitchell said, "I feel like I'm getting back to the basics, the essence of my life, away from technology and my work." It was peaceful, relaxing, rejuvenating, and joyful. "Sunshine, summer breeze, good friends, and a good cause make me feel fine," shared Ruth Ann White. "We raised over $1400 in our fundraiser! And the fellowship and learning for all involved was beyond measure." Mrs. Sacksen often reminded church members that we were developing friendship gardens. 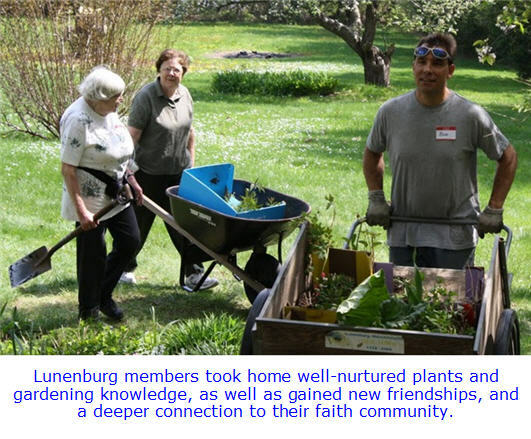 Participants took home well-nurtured plants and gardening knowledge from a friend, but they also took home new friendships and a deeper connection to their faith community and its role in the world. United Parish of Lunenburg learned that growing gardens changes lives. In this case, it changed the lives of Heifer International families and the lives of United Parish members and families. Stephanie and Ruth Ann can be reached at the church office at (978) 582-6572 or upl@upoflunenburg.com while Rev. Burr is on sabbatical.